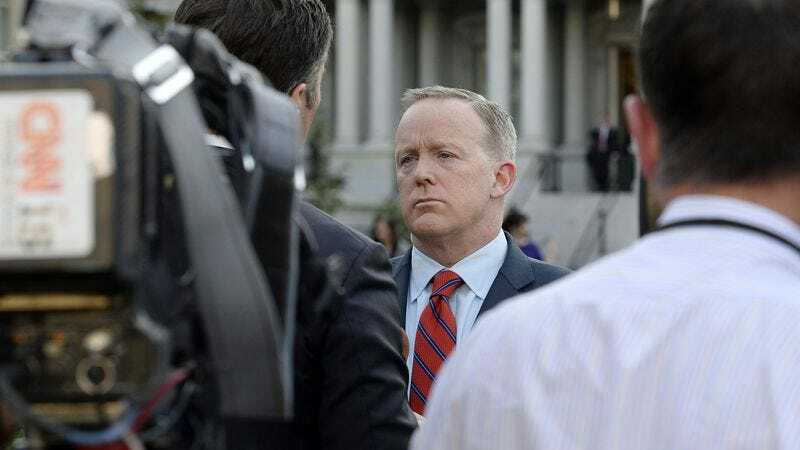 It’s been a particularly harrowing afternoon for the United States, as White House Press Secretary Sean Spicer inexplicably decided to bring up Adolf Hitler while talking about Syrian President Bashar al-Assad’s use of chemical weapons on civilians last week. In an attempt to illustrate just how bad Assad is, Spicer suggested during a press briefing that not even Hitler sunk so low as to use chemical weapons “on his own people,” and he then referred to Nazi death camps as “Holocaust centers.” Plus, he did this in the middle of Passover. At best, it was pretty much the worst comparison anyone could make and also he made it really really poorly, and at worst, Spicer was literally promoting white supremacist talking points about how the Jewish people that Hitler killed weren’t real Germans and therefore it wasn’t that bad that he killed them. So it’s all good now, and we have no reason to worry that anyone in the White House was trying to diminish the impact of the Holocaust. Of course, Spicer really only apologized for bringing up the Holocaust, not for his assertion that Hitler didn’t gas “his own people,” so the neo-Nazis and “alt-right” creeps can still comfortably interpret what he said as an endorsement of their horrid beliefs, but at least he was willing to acknowledge that the Holocaust happened. The bar for this idiotic administration may be set pretty low, but that’s still a bit better than where we were earlier in the day.